Trillanes has turned the Philippine Senate building into his personal panic room. Is “senator” Antonio Trillanes really that relevant to me? Indeed, while the Philippines’ economic and fiscal managers work hard to deal with the ebbs and flows of global trade and their effects on day-to-day domestic commerce that, ultimately, impacts individual Filipinos’ purchasing power, Trillanes focuses primarily on petty politics. The Philippine Senate has long been hard-pressed to prove its value to ordinary Filipinos to begin with. Characters like Trillanes hardly contribute to propping up that proposition. Instead, he is devaluing the Senate, more so now that he is using the Senate building itself as his personal panic room. “As far as our records are concerned, he did apply. And that it was deliberated by the DND ad hoc committee, and it is embodied in Resolution No. 2. And the summary of all these deliberations by that ad hoc committee was sent to me on January 25, 2011,” Aquino said. The granting of amnesty was the last step in the negotiations between the government and the concerned individuals, said Aquino. “This was the last step in a lot of negotiations that we had in precisely how to move on and have the reconciliation aspect. Perhaps it should… bear pointing out that everybody from the rank of Master Sergeant up, were not authorized the proclamation to be reinstated, and actually forfeited certain benefits… including back pay for the time they were… they left the discipline of the Armed Forces,” he said. Even after reading the above statements multiple times, it is difficult to ascertain whether the full process of granting “amnesty” to Trillanes was actually completed. The only clear takeaway from BS Aquino’s ramblings is that Trillanes “did apply” for this “amnesty”. Whether or not it was actually granted as part of official procedure remains in question. So far there is no concrete evidence that actual approval of this “amnesty” actually transpired or was effected with absolute finality. The short of it is that none of what’s been said above had so far been corroborated by an objective disinterested third party, nor has physical proof that proper procedure was followed been presented. If the above constitutes the only set of evidence the Yellowtards have to present to substantiate their case, then Trillanes is clearly in trouble. Because of what so far seems to be a weak case, the Yellowtards have opted for their all-too-familiar approach to getting their way: “people power”. Yellowtard leader Senator Francis “Kiko” Pangilinan is now calling for Filipinos to mass around the Senate building to “protect” Trillanes from “illegal arrest”. This is a familiar tactic. Rather than work towards clarity, the Yellowtards are deliberately adding confusion. They are not out to reveal the truth. They are working towards muddling it. Filipinos need to take stock of what is going on and what the Yellowtards are really doing. Their aim is to destabilise a duly-elected government because their singular goal is to seize power. This makes them no different from the communists who have a similar objective: to overthrow legitimate governments and install a dictatorship of the proletariat. “Senator” Antonio Trillanes is no more than the latest rallying point of these economic saboteurs. Much of the shrill messaging the Yellowtards are now frantically fielding on social media amount to no more than mere appeals to emotion. There is practically zero intellectual payload in the actual content of their messaging. Most important of all, the only real and tangible outcome of these circuses being perpetrated by the Yellowtards is instability. And instability, as any economic manager will tell you, makes investors jittery. Filipinos do themselves a disservice by supporting destructive and irrelevant causes such as those instigated by the Yellowtards. It’s time they make a real choice. It’s time they find themselves a real set of truly genuine Opposition voices and leaders — ones that look out for the broader public wellbeing and not just their dishonest political agendas. I suddenly remember a discussion with a Yellowtard insists on blaming more on Marcos for the highest inflation rate of 62.80% in 1984, called it “shocking data”. But I’m totally unfazed on his “appeal to the emotions” tactic because as far as I know, every economic manager will tell you that political instability can also cause higher inflation. Even the IMF had a research paper of it. Thanks for this article, I’m now convinced that the Yellows are economic saboteurs and they made Trillanes on the front. 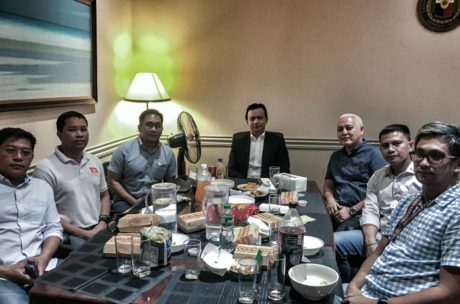 Trillanes again is insinuating – via his media briefing sessions as of late at the Senate – that some people in the AFP would again, attempt a coup for him if ever he gets arrested. Playing brinkmanship games once more. The trouble is, Duterte is also fond of playing brinkmanship games – and I don’t think this amateur politician could ever one-up Duterte’s game who has been hustling at this arena (politics) for years and years ahead of him. Way before he was in diapers (Trillanes). back when the yellows are lording it over the media, they can splice speeches, video clips and interviews to their favor. not anymore with the live streaming where everything is seen real-time. even ms Arroyo (GMA) is getting her payback without even lifting her finger as yet. CJ Corona Rested IN Peace and will continue to do so, incapable actually of doing anything but got his revenge. and Angie Reyes, an elder like Enrile never spoke a word and trillanes is getting flushed down. Pnoy and Gazmin knew it’s illegal to grant amnesty to military men that’s why trillanes application was missing they didn’t file it. Poor trillanes all he knows he’s free. His freedom is fake. And of course PNoy & Gazmin will be sued at the Ombudsman, soon if the truth foretold that they faked it or created the so-called “ghost” amnesty certificate of Sen. Trililing. That is against the law!!! Like the story of “La Mancha”, Trillanes is so swallowed up by this idea of chivalrous heroism that he can no longer distinguish what is reality from fantasy. He use the word “patriots, democracy, freedom,” but in the end, it;s just all about him, to transcend his image to become larger than life, a hero, but failed by his own folly. We have a real comedian, by the name of Sotto, who became the Senate President. Sotto, is the “sleeper agent” of Aquino and the Aquino Cojuangco political axis, in the Senate… He became the protector of that AFP renegade , Trililing Trillanes. will ever become a “balimbing”; Aquino will just present this amnesty papers to the proper authorities. It is some sort of a “blackmail”; but it works, for Aquino. The social media people are just watching on the background commenting…This is the “final push” of the Aquino Cojuangco political axis, to regain their lost power. They are creating the exact replica of 1986 EDSA. It is up to the sensible Filipino people, if they would bite again on this “political bait” of the Aquino Cojuangco political axis . It is the “political game”, they have to play ! What is so funny about Filipinos going loco over laws and justice is FILIPINOS FINDS FORENSIC EVIDENCE foreign and unintelligible. They prefer typewritten, signed and notarized AFFIDAVITS. Once this is submitted there will be war of Affidavits and counter-attack-Affidavits. If these ding-dongs have Evidence as defined by 1stWorld countries they wouldn’t have come down to point-point and turo-turo justice system. Yet, all columnists and bloggers in the Philippines prefer turo-turo accusations because they themselves do not believe in EVIDENCE and FORENSICS. Their evidence is the din of noise. The more noise the more guilt. WoW !!! Well, anyways, Filipinos have malnourished 3rdworld brains. Wherever they go anywhere in this world may they be born in 1stWorld countries they still have 3rdworld brains because the Filipinos are GENETICALLY inferior and GENETICALLY MENTALLY RETARDED. It is Duterte who is CAUSING this instability by revoking amnesty. He should focus instead on managing the economy which he hasn’t done a good job of. If they want change. They have to be elected by the Filipino people. No SMARTMATIC…no HOCUS PCOS… No COMELEC…There are many saboteurs in our economy. The Aquino Cojuangco political axis, lost its power. It wants to regain its power thru an EDSA replica. They want to subvert the will of the Filipino people…the election cheating showed, they are all crooks. Pres. Duterte remains popular, among the Filipino people. The Fake VP Lugaw Robredo, the Queen of Shabu is detested and is very unpopular. There is an outraged on the 2016 SMARTMATIC HOCUS PCOS election…Many Filipinos are sympathizing with former Sen. Bong Bong Marcos, Jr. He may become the next President, after Pres. Duterte finish his term. So, the condition is not the same as 1986 EDSA. No Enrile, No Ramos…No U.S./C.I.A… No Trump…people still are aware of the incompetence, corruption and abuses during the Aquino era. These YellowTards are really stupid ! I’m not sure if you’re that dumb or you’re just trolling. The revocation didn’t come out of nowhere; they just investigated the case two years ago. Weird that the media BARELY reported that. Another fearmonger on the loose, ladies and gents. Stupid, dumb YellowTard…Asslicker of Aquino ! Aquino wasted time going after GMA and Corona. Now Duterte is wasting time going after Trillianes. Focus on the ECONOMY stupid. Otherwise GO EAT BUKBUK RICE! i can smell trillanes will be betrayed and keep him silent. he better surrender to the AFP for his safety. he might be assassinated then blame it to pres duterte. To be relevant, one must seek knowledge. FaiLipinos have knowledge … they top board exams … bar exams … any exams … they even speak good English, their measure of intelligence, and, most of all FaiLipinos has the highest literacy rate in Asia at 96.1 percent. Here is the problem with FaiLipinos … they do not know what to do with their literacy and knowledge !!! LIKE, FaiLipinos are religious yet do not know how to apply it they just keep on thieving and killing each other. FaiLipinos still celebrate the KILLING OF FERDINAND MAGELLAN. Ferdinand Magellan came to FaiLipines to spread the word of god instead Lapu-Lapu killed him and FaiLipinos celebrate the killing while praying to God. DO NOT MAKE SENSE AT ALL.